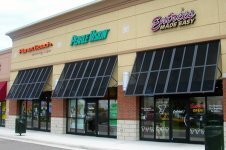 Bahama Shutters | Willard Shutter Company Inc.
Bahama Louvered shutters feature an easy to operate, open louver* shade and storm shutter system that captures the charm and sophistication of traditional wooden louvers. The Bahama Shutter hinges at the top and projects out over the opening giving protection from sun and weather, and closes securely over the opening in seconds. It features a continuous, extruded aluminum header (top hinged mounting device), and is supported in the open position by adjustable (telescoping) or fixed arms. It is secured in the closed position with a mechanical tie down (machine screw and machine screw anchor) or an optional, integrated pin-latch system that allows for tool-less operation. The shutter projection is adjustable, and may project up to a maximum angle of 44° unless specified otherwise. The traditional style of the Bahama shutter has genuine practical and aesthetic qualities that are essential to island style living; and Colonial, Mediterranean and Caribbean architecture. More than being highly decorative, they provide an unmatched combination of light and shade, and proven storm & hurricane protection. 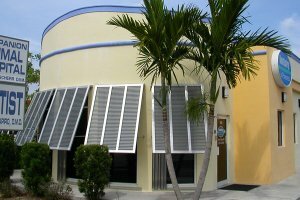 In some cases, Bahama shutters can reduce cooling costs as much as 60%. Naturally ventilated, they work well over open windows, walkways, and other exterior areas that need sun and weather control. In many cases, they are used for a simple, cost effective, aesthetic improvement to otherwise plain building facades and structures. Being versatile in construction and function, this product is adaptable for use on most residential, institutional and professional buildings. * “Open louver” refers to a ventilated panel composed of individual louvers used in series. This is in contrast to solid-backed or false louver systems that give the appearance of a traditional open style louver. In addition to traditional, open louvers, Board & Batten type and solid shutter panels are also available upon request.